August 21, 2012  Shrapnel from rockets fired at Bagram air field damaged the plane that had been set to fly the chairman of the Joint Chiefs of Staff out of the country. Two maintenance workers were slightly injured. 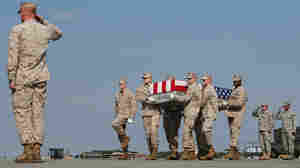 Gen. Martin Dempsey left on another aircraft. August 20, 2012  America's top general is in Afghanistan, in part to discuss how to stop the "green on blue" attacks that have left 10 U.S. military personnel dead in just the past two weeks. One step that's already been taken: Armed coalition soldiers are now watching their Afghan counterparts during missions.